Certified Canine Massage Therapist (CCMT), certification in First Aid and CPR for Pets, Reiki Level I & II. I have worked with dogs and cats in one capacity or another my entire working life. Ever since I was a small child, I have been able to make a connection with animals of all sorts. I could empathize with them, make a connection through a calm demeanour and positive energy in a relatively short period of time, thereby winning their trust when others couldn't. Friends, family and even strangers have commented that I have "a way" with animals. I continue to strengthen this connection with animals, especially with dogs and cats, over the years by working with them in many different settings and circumstances, by being an animal parent all my life, and by being attuned to Reiki Level II (healing through the channeling of energy - something animals are very much in tune with). 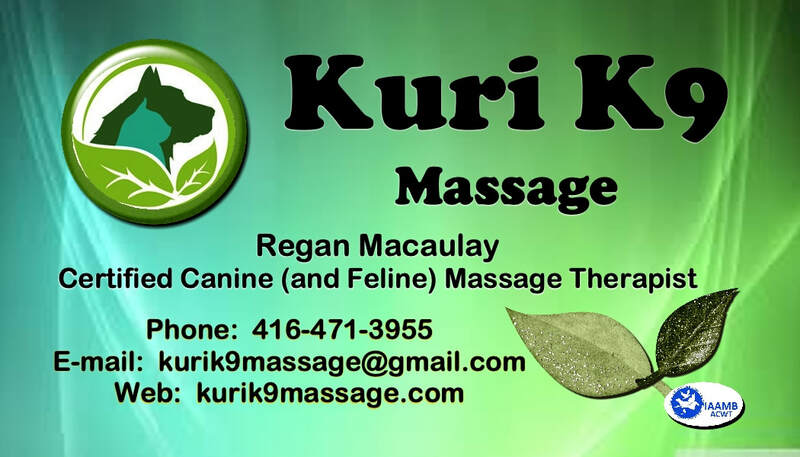 Reiki is a non-invasive technique I carry with me and supports my work in every canine (and feline) massage therapy session. The session is therefore much more meaningful and positive both physically and emotionally to your pet. One of my first animal-related jobs was as Animal Wrangler and Animal Care Specialist for the children's television program Once Upon a Hamster during its third and final season in 1997. In 1999, I became a Receptionist and Vet Assistant at the Cat Doctor in Toronto for five years. Later I worked at Pet Cuisine and Accessories from 2008-2011 before making the decision to pursue further studies in animal healing. I began with the Treetops Canine Massage Therapy program (Sheilagh O'Sullivan, instructor) in January 2012. The program included an Animal Anatomy and Physiology course and hands-on massage sessions on 10 different dogs (four or more massages each) and 4 cats. After the completion of 44 case study massages and two written exams, I was certified to practice canine massage on October 1st, 2012. I am now insured through Henry Equestrian Insurance Brokers Ltd. I am also a member of the International Association of Animal Massage & Bodywork (IAAMB). I continued with Treetops and e-Training for Dogs, taking a course in Herbal Remedies and Aromatherapy (for personal use - I received my certificate October 6th, 2012), Pet First Aid and CPR (certification received October 24th, 2012), and the All-Fit Dog course through e-Training for Dogs and DogWorks Canine Fitness (Racine Hyatt, instructor), where I learned how to improve fitness in dogs for overall wellness. I also enrolled with Rob Fellows at Reiki 4 Dogs in the UK to receive certification in his course entitled Reiki Animal Healer (Reiki Level I - for cats, dogs, horses, and small or wild animals). I received my certificate October 23rd, 2012. I continued my studies in Reiki (Level II) with Marci Burgess of Reiki for Pets & People, receiving my Level II certificate October 25th, 2015. I look forward to future studies in animal healing, animal communication, and crystal healing for animals. I am currently a volunteer at the Toronto Humane Society (in the Canine, Feline, and Special Species departments), and also received a certificate for my involvement in the "Dogs Playing for Life" seminar with Aimee Sadler, including follow-up hands-on training at the Toronto Humane Society (October 19-22, 2014). For more information on this program intended to enrich the lives of shelter dogs, click HERE. Other careers, past and present, include writing, directing, and producing for theatre, film, and television, as well as writing prose (children's picture storybooks and novels, and short stories for children and adults). When I'm not massaging animals, or writing, I spend time with my husband (a writer and a librarian), my friends and family, including multiple amphibians, my seal-point Siamese mix, Sookie, and my Chihuahua, Raxl. Check out Frodo, my blue-point Siamese cat who has crossed over to the Rainbow Bridge - he and his sister, Prea, are the feline stars of Space Zombies: 13 Months of Brain-Spinning Mayhem! (available on iTunes and now, DVD!) For more information on my artistic projects, like Space Zombies!, visit tripletake.net. For more information on my work as an author, visit reganwhmacaulay.weebly.com.